As a child, Keith Thibodeaux (stage name Richard Keith) played the most famous child in television history; "Little Ricky" Ricardo. Born in Louisiana, Keith was discovered at the age of three by bandleader, Horace Heidt. After two years in bigtime show business, Keith's name and future were changed when he was cast as Little Ricky on I Love Lucy in 1956. His professional name became Richard Keith, and he appeared with Lucille Ball and Desi Arnaz on their TV show until 1960, when the couple divorced. Keith grew very close to Desi Arnaz Jr. and Lucie Arnaz, but relations with the Arnazes became strained in the early 1960s. Desilu Studios had no regular work for Keith, who was relegated to playing small parts on sitcoms filmed on the Desilu lot. When Keith's father had a disagreement with Lucille Ball, she fired him from his position at Desilu. This forced Keith and his family to move back to their native Louisiana, as they could no longer afford to live in California. After I Love Lucy went off the air, he continued his career as a child actor, appearing in other sit-coms, including "The Andy Griffith Show." Apparently influenced by his television counterpart, he gave up acting for music and like many baby boomers, Keith sought solace in alcohol and drugs and followed the same downward spiral that happened to many other former child actors. He eventually became the drummer for the contemporary Christian band "David and the Giants", after his personal religious experiences. Currently, Thibodeaux is the executive director of Ballet Magnificat, a Christian ballet company located in Jackson, Mississippi. His wife Kathy, a ballet dancer, is the artistic director and founder of the company. Together they have one child, a daughter named Tara and tour all over the world. Keith's memoir was published in 1993. In 1994, he published his autobiography, "Life After Lucy" (New Leaf Press), which not only offered an insider's view of Lucy and Desi but also explained how Christianity changed his life for the better. 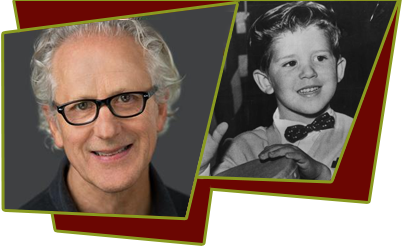 Keith Thibodeaux was actually the sixth Little Ricky. Joseph and Michael Mayer twins played Little Ricky as a toddler from Season 3 through Season 5. Another set of twins played Little Ricky as a baby, Richard and Ronald Lee Simmons, who made their debuts in "No Children Allowed," and were featured for the balance of the 1952-53 season. One other Little Ricky appeared in Season Two as the first Little Ricky as a baby in "Lucy Goes to the Hospital", James John Ganzer.